One day before serving, prepare the lemon cream: Place the gelatin in a dish of cold water to soften. Zest the lemon, then squeeze the juice. Strain the juice into the top of a double boiler set over low heat. Add the lemon zest and remaining ingredients, except the whipped cream. Whisk continuously until the mixture thickens. Remove from the heat. Remove the gelatin from the water and add. When the mixture is cool, transfer to a bowl and refrigerate overnight. The day of serving, prepare the almond cake: Preheat the oven to 400°. Line a baking sheet with parchment paper. cocoa powder and set aside. In another mixing bowl, beat the egg whites until just firm, gradually adding the salt and the 1 1/2, tablespoons confectioners’ sugar. Transfer to the ground almond mixture and fold gently with a spatula to combine. Transfer the almond batter to the prepared pan and spread evenly. Bake for 15 minutes. 3 equal pieces. Set aside. cream over the chocolate. Wait 1 minute, then stir. Refrigerate until firm. heat. When warm, transfer to a mixing bowl, add the butter and beat until light and fluffy. Transfer to another bowl and add the whipped cream, folding gently with a spatula. Set aside. Remove the lemon cream from the refrigerator. Whisk in the whipped cream until well blended. 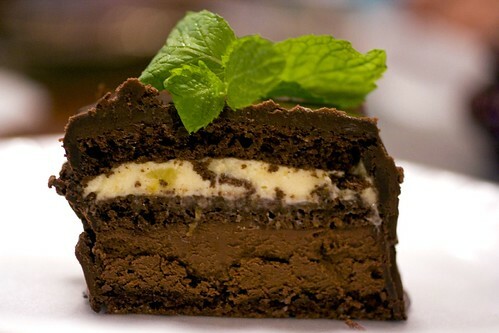 To assemble the cake, place one cake layer on a serving plate. Spread the chocolate cream evenly and top with another cake layer. Spread the second cake layer with lemon cream and top with the remaining cake layer. Refrigerate for at least 1 hour. evenly. Refrigerate for 1 hour more. About 30 minutes before serving, cover the cake with Chocolate Glaze (see after recipe). This cake will keep for 24 days in the refrigerator. place in a heatproof bowl. Pour the boiling milk over the chocolate and stir gently to blend; do not beat. Add the glucose and butter; and stir until the mixture is smooth and glossy. preparing in advance, reheat to soften in the top of a double boiler before using. This glaze will keep, covered, up to 1 week in the refrigerator. Preheat the oven to 400°. Grease a baking sheet. Prepare the ganache: Grate the chocolate into a heatproof bowl. Bring the cream to a boil. Immediately pour over the chocolate. Let stand for several seconds, then stir until thoroughly melted. Set aside. 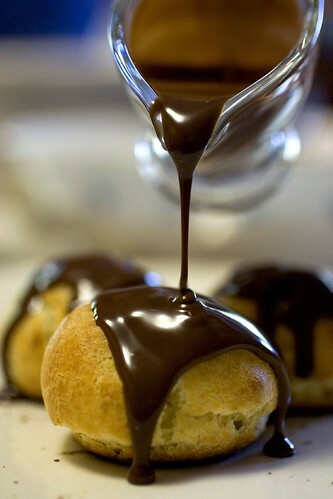 Prepare the choux pastry: Place the egg yolk in a small dish with 1 tablespoon water and beat. Set aside. Break the whole eggs into a mixing bowl and beat. Set aside. Place the milk, salt, sugar, and butter in a saucepan and bring to a boil. Stir with a spatula and add the flour all at once. Be sure to stir continuously. When the mixture is thoroughly blended and begins to come away from the sides of the pan, cook for a few seconds more, then remove fiom the heat. Add the beaten whole eggs gradually, in batches, stirring constantly. The mixture should be soft, but not too liquid. diameter onto the prepared sheet and space about inches apart. Brush the tops with the beaten egg yolk. You should have 20-25 pastries. Bake until golden, 20-30 minutes. Remove from the oven. With the tip of a small sharp knife, make a small slit in the side of each pastry. Place on a rack to cool. Prepare the pastry cream: Place the milk in a saucepan, add the cocoa, and bring to a boil. Meanwhile, place the egg yolks in another saucepan, add the sugar, and beat until lemon-colored. Stir in the flour. Slowly pour in half of the hot milk, whisking continuously, until smooth. Add the remaining milk and place over medium heat. Cook, whisking continuously, until thick. Remove from the heat. Add the ganache to the hot pastry cream and stir to blend. Set aside to cool completely; stir often to release the steam and prevent the cream from getting soggy. Fill the pastries with the cooled pastry cream, using the slit in the side. Prepare the glaze: Repeat step 2. Fill and glaze the choux. *We didn’t want to fuss over fondant (nor can we find one in our local supermarket) and just used chocolate ganache instead. Is the sheet of gelatin just a prepared box of knox unflavored, straight out of the fridge? VeggieGirl: They are. You should try and bake ’em! HiDude: Nope. Gelatin is sold in two forms, powdered (the one that we all know is the Knox brand) or in a pack of sheets. Just read this portion of Serious Eats’ post, this should help you out. oh wow…the cake looks amazing. what a beautiful cross-section. great job! hey, what did u bake the cake in? what size pan? teddy: I used a sheet pan lined with parchment paper. Then follow the instructions accordingly. I shaped the cake free-handed, which wasn’t exactly a smart move on my part.